A former Premier League footballer has been jailed for two-and-a-half years after being convicted of match fixing allegations. Delroy Facey, of Woodhouse Hill, Huddersfield, was found guilty at Birmingham Crown Court of conspiring to bribe non-league players. Judge Mary Stacey said Facey's offences struck "at the very heart of football". Facey, who played for Bolton Wanderers, West Bromwich Albion and Hull City, had denied any wrongdoing. Former non-league player Moses Swaibu, 25, of Tooley Street, London, was also found guilty of conspiracy to commit bribery. He was jailed for 16 months for his part in the conspiracy. The two were arrested as part of a National Crime Agency investigation into match fixing. The trial heard Facey urged a footballer at a struggling non-league club to make some "easy money" by fixing the result of a match. He also told a contact some Football Conference teams would "do" a game in return for payment, the jury heard. In one text conversation in late 2013, Facey tried to corrupt a Hyde FC player by offering him £2,000. During the messages, Facey told the player a friend who was betting would provide the cash. Transcripts of messages that passed between Facey and 43-year-old Krishna Ganeshan were shown to the jury. In one exchange, in October 2013, Ganeshan told Facey to "keep your boys on stand-by", the court heard. "If they deliver first time, me and only you are in big business for the future," Ganeshan messaged. Ganeshan was found guilty in June, alongside Singaporean national Chann Sankaran, with both being jailed for five years. 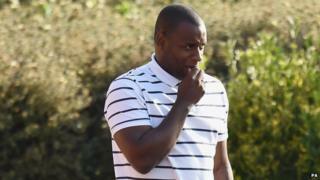 Former non-league player Michael Boateng was also jailed for 16 months in June for his part in the conspiracy. The judge told Facey: "It's about the fans of the teams involved, the families who follow the fortunes of their teams with passion, loyalty and devotion. "You have betrayed all that trust, all that confidence and it's like a cancer at the heart of football." Ecky Tiwana, in mitigation for Facey, said: "It has not only been a professional tragedy but a personal one. "The stigma of being the most high-profile footballer being convicted of this type of offence - that will have a lasting effect on him, for the rest of his life." Speaking after the sentencing, Andy Young, from the CPS, said Facey had acted as the "middleman", sourcing players who would be willing to fix matches. "When he played professional football, he earned good money, being paid over £65,000 in 2010/11. "But by the time of his arrest, he was no longer playing professionally and was earning considerably less," Mr Young said.